Links - Cat the Vet The official site of the Royal Collage of Veterinary Surgeons. Contains very useful information about veterinary surgeons, their standards and practices. 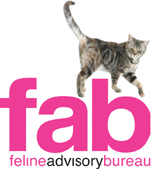 This is a great website run by the charity the Feline Advisory Board (FAB). It contains a wealth of great information all about cats, from diseases and behavioual problems, to helping you find a good quality cattery. The Dogs Trust is a brilliant charity, and the place to start looking if you want a dog! The Cats Protection League is a great charity that rescues and rehomes stray cats. If you are looking for a cat, contact your local CPL, they will be happy to help. The Cinnamon Trust is a wonderful charity which helps elderly or sick pet owners care for their pets, by walking them, or looking after them if their owners are unable to do so. A Good website of veterinary advice. Contains a good section of first aid advice and helps you decide whether you need to call the vet or not. This is a very nice article from Positive Health Wellness about how to improve both your own and your pets health!